Built upon MEBO’s innovative technologies and products for the regeneration of wounded skin that leads to restoration of normal skin structure and function, MEBO has developed a series of products that are formulated for oral delivery and can be taken conveniently in the form of soft gel capsules by users to maintain the integrity of or to repair/regenerate the mucosal tissue without scar formation. Similar to the process of regeneration of the epithelium of the skin, repair or regeneration of damaged or eroded epithelium on the mucosal lining can be achieved by activating and sustaining intrinsic regenerative potential of the body and cultivating stem cells of the body in situ, i.e., right at the site of ulcerative lesion. As shown below, the mucosal tissues of those who suffered from various GI disorders (such as gastric ulcer, duodenal ulcer and erosive gastritis due to the side effects of chemotherapy and radiation) can be regenerated after a month of taking the MEBO regenerative nutrients. The newly regenerated mucosa is scarless. 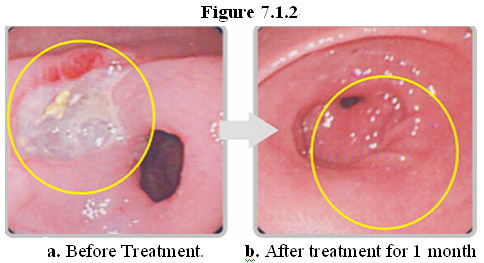 Case I: Female, age 46, peptic ulcer in the antrum of the stomach. 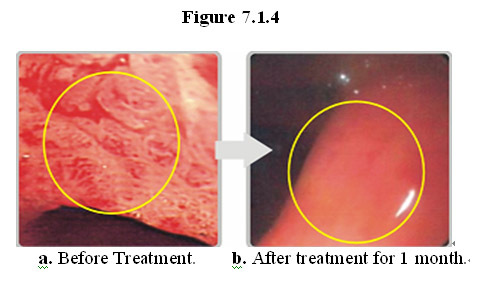 Case II: Female, age 50, peptic ulcer in the antrum of the stomach. 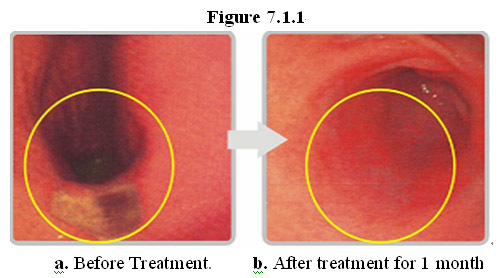 Case III: Male, age 41, duodenal ulcer. 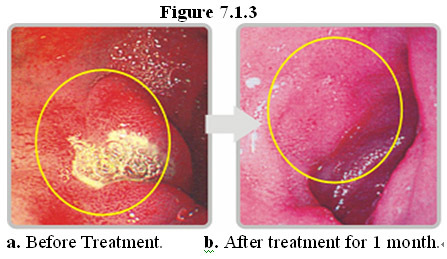 Case IV: Male, age 59, peptic ulcer and erosive gastritis due to pancreatic cancer chemotherapy and radiation therapy. 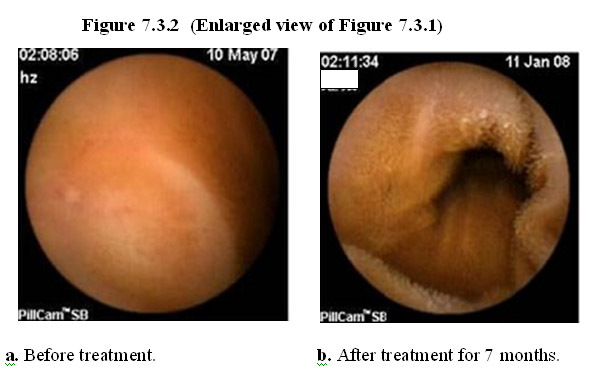 As shown below in Figures 7.3.1 and 7.3.2, healthy adult humans, even if having degenerated/atrophic shortened villi on the GI lining due to aging, can still benefit from the regenerative power of the MEBO nutrients which promote re-growth of lush, longer villi (which are associated with a more youthful human body). By using the MEBO nutrients to regenerate the GI lining without scar formation, the GI system is revitalized functionally to allow better absorption of nutrients to the body, which, in turn, leads to nourishment of the body systematically. Case 1: Female, age 55, healthy. 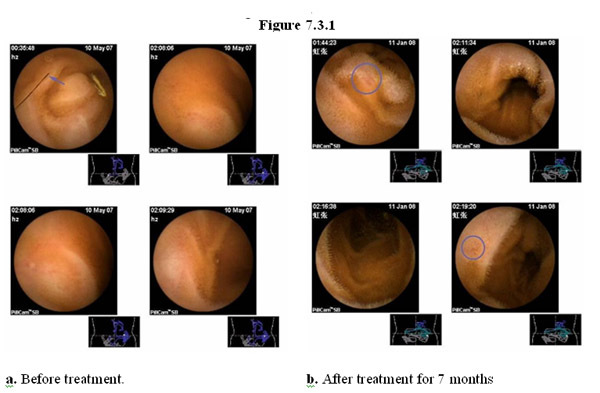 Normal human living intestine was obtained from surgical operations, and enzymatically digested so as to obtain dispersed single cells from the intestine samples. The suspended intestinal cells were cultured in MEM medium and divided into two groups: test group and control group. The MEBO regenerative nutrients were added to the cultures in the test group, while the control group did not receive any supplement. Every 3 days the old growth medium was discarded and fresh growth medium same as the first round was added to the cultures in the respective groups. After 55 days of culture, in the treatment group the cells had grown into groups of cells appearing in various forms, including proliferation and differentiation of the cells isolated from human intestine samples. As shown in Figure 7.4.1.1a-c, in some areas, some of cells formed clusters that appeared to look like pieces of tissue. Surprisingly, it was observed that in some areas, tissue pieces resembling a fully assembled villus structure appeared in the culture Figure 7.4.1.1d. In comparison, most cells in the control group had died by Day 55. 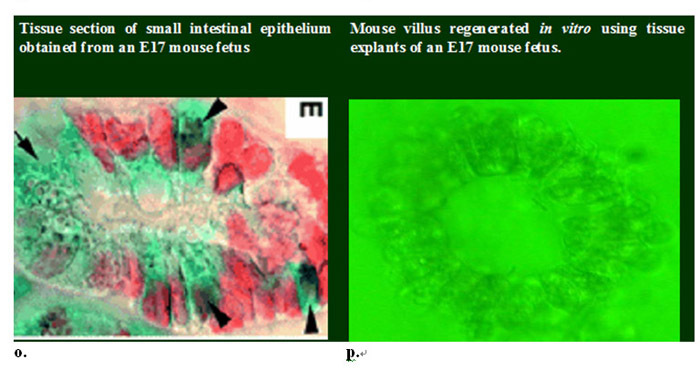 To verify whether intestinal villus can be formed from proliferation and differentiation of isolated dispersed intestinal cells in vitro in the presence of the MEBO regenerative nutrients, experiments were conducted using intestines isolated from a mouse fetus (Figure 7.4.1.2a-c). The mouse fetal intestine was cut into small explants and cultured in cell culture medium in the presence or absence (control) of the MEBO regenerative nutrients (Figure 7.4.1.2d-f). Consistent with observation of cells from human intestines, single cells migrated from the explants started to form clones (Figure 7.4.1.2h-i) in the culture which grew to form tissue pieces having the same structure of a villus were formed in the presence of the MEBO regenerative nutrients (Figure 7.4.1.2j-m). In comparison, intestine explants in the control culture disintegrated (Figure 7.4.1.2g). A cross-sectional view (Figure 7.4.1.2n, p) of the villus shows that the tissue formed in vitro in the presence of the MEBO nutrients has the same structure as that obtained from tissue sections of intestines of a mouse fetus (Figure 7.4.1.2o) as shown in Yang et al. (2001) “Requirement of Math1 for secretory cell lineage commitment in the mouse intestine” Science 294:2155-2158. These results are groundbreaking as they demonstrate that the MEBO regenerative nutrients can sustain vigorous proliferation and facilitate orderly differentiation of somatic cells for a long period of time to form multiple cell types that are linked together to form tissue with physiologically correct structure in the culture. From single, isolated cells from human and mouse intestines at least 4 types of cells are formed: entercytes, mucus-secreting goblet cells, enteroendocrine cells, and Paneth cells which are originated from epithelial stem cells in the crypts of the intestine. Although it remains to be ascertained the nature of the single, isolated cells that produced the multiple cells types in the culture containing the MEBO nutrients, it is significant that physiologically correct tissue has been cloned in vitro from single cells isolated from intestines. To our best knowledge, there is no report from others with the same results. 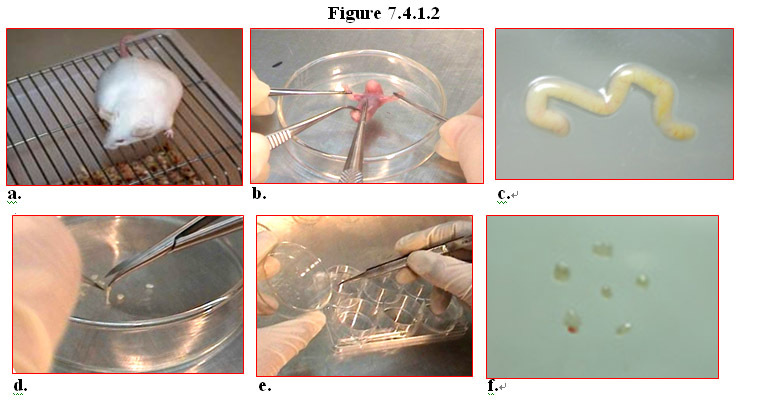 To further test the ability of the MEBO regenerative nutrients to facilitate cloning of physiologically correct tissue in vitro, experiments were conducted on explants of mouse intestine. Explants of mouse intestine were obtained and a few villi on the explants were excised and cultured in normal cell culture medium. The cultured explants were divided into two groups: test group and control group. The MEBO regenerative nutrients were added to the cultures in the test group, while the control group did not receive any supplement. As shown in the panels in Figure7.4.4.1a-d, in the treatment group the explants not only survived but also grew new villi from the wound where the original villi had been removed. By day 6, nascent structure of villus started to appear on the wound, and by day 8 regeneration of multiple new villi with the same physiological structure as the original ones was complete. By contrast, explants in the control group gradually disintegrated and died in the culture (Figure7.4.4.2a-d). So far our extensive literature search has not found reports of such results of regeneration of villus from explants cultured in vitro. These results are significant as they once again demonstrate that the MEBO regenerative nutrients are able to promote regeneration of injured tissue and organ, consistent with the clinical results obtained from wound and ulcer patients. Scientifically groundbreaking is the fact that under the condition provided by the MEBO regenerative nutrients, normal somatic cells can behave like stem cells to proliferate vigorously and differentiate orderly to produce multiple cell types which eventually form tissue with physiologically correct structure, both in vivo and in vitro. These findings are illuminating in that the MEBO regenerative nutrients can be delivered not only topically but also systemically to facilitate regeneration of injured or aged tissue and organ in the body.